The Columbus Evening Dispatch, Saturday August 27, 1881, front page. And by WHALE, the Menagerie meant an actual dead whale that was quasi-taxidermied and carted around from one American town to the next. (Not to be outdone, the Burr Robbins Circus exhibited a giant paper-mâché whale a few years later. The two whales dueled their way across the United States fighting for audiences, often picking up on each other’s publicity.) For decades, this Music Man-like showmanship was how the American public saw real, genuine whales. The Columbus Evening Dispatch, Tuesday, March 8, 1881, front page. 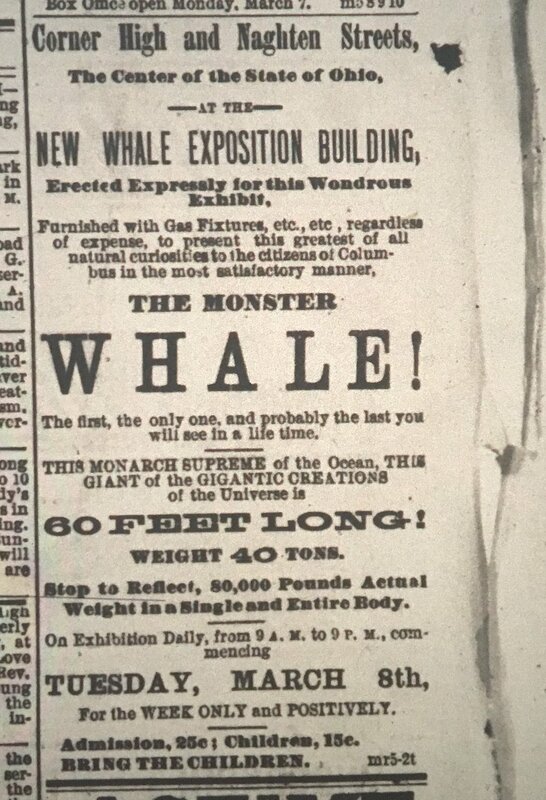 For the nineteenth-century Menagerie-goers, seeing the real whale in the flesh – more or less – wasn’t really so much about the actual whale itself, but about how the whale’s keepers had so effectively cheated the decay of death to bring the whale to them.